On a fire escape, Donnie and April are enjoying dinner together. April asks why the other Turtles didn't show up and the Don explains that Leo is off training by himself and Raph and Mike are going to sneak into the movies together. April goes down into the alley below and is confronted by a pair of Purple Dragons, whom she handily defeats. No sooner does Don show up to give her a hand, Dogpound storms the scene. April and Don make a break for it with Dogpound and the Purple Dragons in tow. Down in the lair, Mikey reveals his scheme to get himself and Raph into “Legendary Fists of Steel 2”. And that scheme involves drag. Raph is hesitant, but as he really, REALLY wants to see the movie, he concedes to follow Mikey’s plan and puts on the dress. On the rooftops, Leo is exercising when a throwing knife carrying a note whizzes past him. It’s a challenge from Karai to keep up. Leo spots her and sends his own reply, “tagging” her to try and keep up with him. After a little runaround, they rest on the roof of the Argosy Theater. Leo puts away his weapons and asks to have a serious chat with Karai. Back in the alleys, Don and April attempt to hide in a dumpster, but Dogpound sniffs them out. Realizing they need backup, Don leads April to the Argosy where they break in through the backdoor. He tells April to find Mikey and Raph in the audience while he barricades the entrance. Dogpound smashes through the door with ease and orders his Purple Dragons to raid the theater. In the aisles, April spots Mikey and Raph (despite their disguises) and they rally against the Purple Dragons. On the roof, Leo asks Karai that if there were no Foot Clan, does she think the two of them could be a team. Karai ponders the suggestion for a moment, at least until Mikey comes crashing through the roof (having been flung by Dogpound). Karai accuses Leo of trying to ambush her and dashes off. Leo lets Karai go and instead chooses to help his brothers in the theater. Leo immediately takes charge, and though the Purple Dragons are down, he knows that Dogpound is too strong for any of them to take in a head-on match. He orders his brothers and April to distract Dogpound and keep him off balance, that way they can each strike and gradually whittle him down to size. After a few decisive blows, Dogpound is out for the count. As police sirens blare in the distance, the Turtles and April scram. Down in the lair, Splinter greets his sons, but the Turtles are in no mood to talk about the evening they’ve had. Splinter shrugs and sits down to watch “Legendary Fists of Steel 3” on TV. *This story is continued from TMNT New Animated Adventures #6. 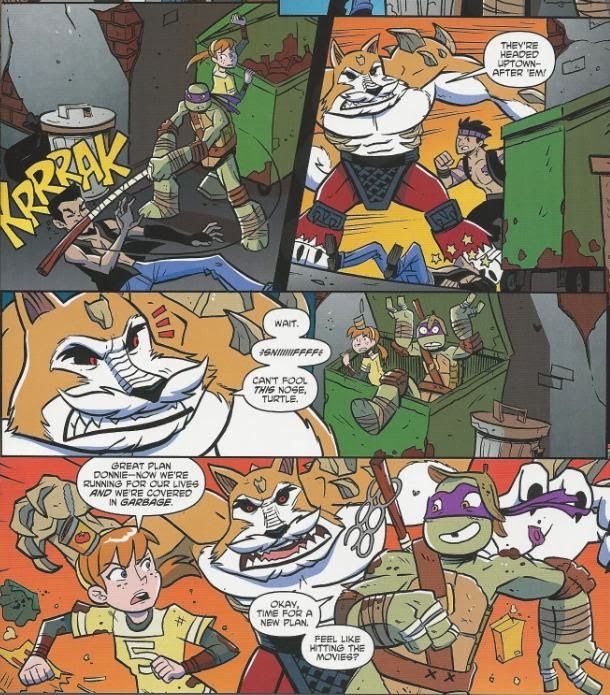 The story continues in TMNT New Animated Adventures #8. *This issue was originally published with 2 variant covers: Regular Cover by Dario Brizuela, and Cover RI by Thomas. For his first issue of New Animated Adventures, Brian Smith writes a pretty hectic tale with a nice gimmick (a “triptych”, I think it’s called). 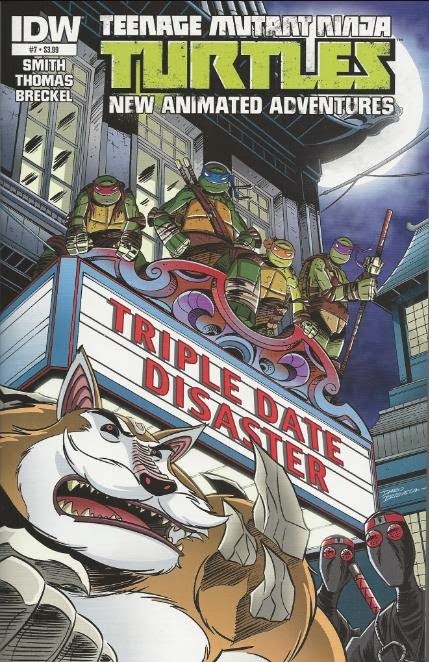 Essentially, we start out with 3 separate narratives all themed around the concept of a “date”, though not a “real” date since Donnie has a one-sided crush on April, Raph and Mikey are brothers, and Leo and Karai are, like, "frienemies" or something. The three narratives eventually converge at the end and everything comes together pretty well. This was a big issue for villains, too. It’s nice to see Dogpound treated like the hulking threat he was originally intended to be, whereas in his last appearance in New Animated Adventures he was defeated rather comically. The cartoon treated him as this unstoppable force in his first few episodes, but quickly relegated him to buffoonery before the halfway point of season 1. 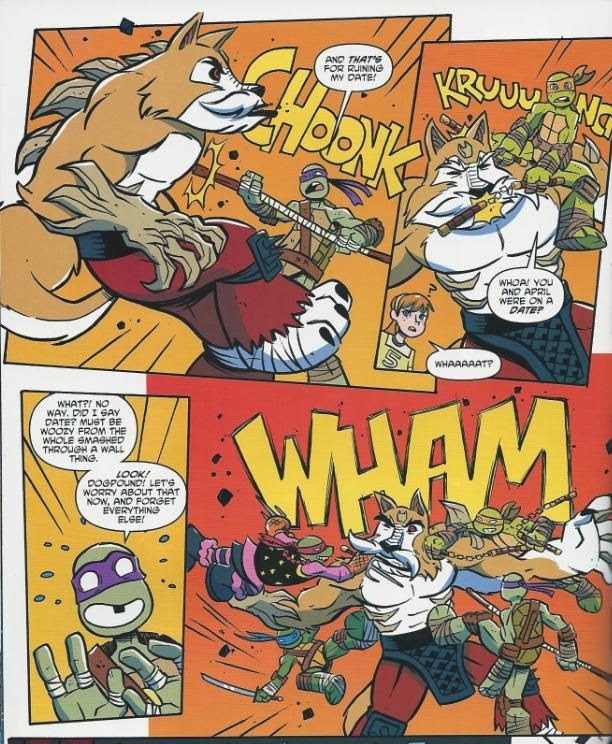 Smith recalls his more respectable portrayal from early in the series and Leo even points out that Dogpound is more than a match for all four Turtles combined and that they’ll need a strategy to stop him. It’s not a GREAT strategy (they hit him one at a time until he falls over), but at least he isn’t treated like a total stooge. 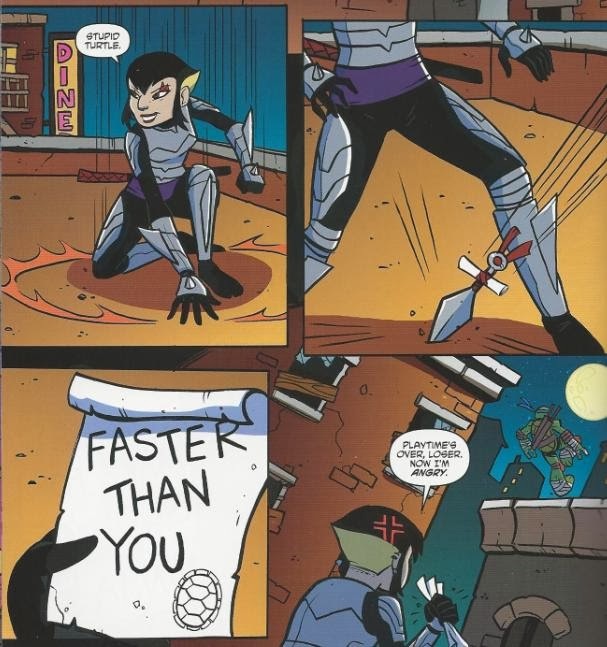 Karai makes her debut in New Animated Adventures, running the same shtick she had in her first few season 1 appearances. Smith kind of gets Karai’s chronology mixed up, though. Mike mentions that Karai is Shredder’s daughter, but the Turtles didn’t learn that tidbit until the episode “Enemy of my Enemy”. And the way they learned that was by trying to kill the Shredder and thus earning Karai’s hatred, eliminating the “friendly foe” relationship she and Leo had previously shared. So either Karai and Leo shouldn’t be all buddy-buddy, or Mike shouldn’t know Karai’s parentage. The other problem is that New Animated Adventures, as a supplement to the cartoon series, isn’t allowed to resolve any conflicts or character arcs from its source material. So Leo trying to talk sense into Karai was doomed from the start, eliminating any tension of the subplot. Chad Thomas, another newcomer to the title, takes on the art duties. His style is looser and more cartoony than Brizuela’s or Archer’s and he employs a lot of the faux-anime sight gags that are so prevalent in the cartoon (which Brizuela and Archer have used sparingly, thus far). You know, stuff like giant forehead veins and big sweat drops. The gimmick is consistent with the show, though, so I’m not holding it against him. Thomas draws perhaps the best April of the New Animated Adventures artists to date, I think. He breaks model from her cartoon design, most importantly in regards to the shape of her head. At the very least, she doesn’t look like some weird plastic doll. Her feet are still humongous, but Thomas actually tries to shape them like feet, instead of those weird… hooves she’s got going on in her cartoon model. Overall, while Karai’s inclusion might be problematic to the Continuity Police, it was refreshing to see Dogpound treated as a legitimate threat. The three intersecting narratives made for a nice storytelling gimmick, too. And while some of the gags were a little weak (I just don’t get why people think drag is so funny), I enjoyed seeing the Turtles throw melodramatic tantrums on the final page. You know, like actual teenagers?